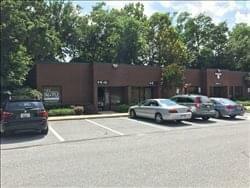 Find My Workspace lists over 95% of the executive office suites market in Owings Mills. Simply click Request Quote to check pricing for one office, or Add to Basket for multiple offices. This is a spacious, well furnished center in a small friendly atmosphere. It is larger than usual offices at a great price. One low price includes wired and wireless internet, all utilities, FREE, use of reception and conference rooms, kitchen and more. There is and abundant amount of free parking just outside the front door. Most of the offices feature windows, many back to park like setting.